A young, very young (27) Democrat took an exurban St. Louis district last night in a special election for a seat in the Missouri House of Reps, beating a 59-year-old Republican by three percentage points in a district that Trump won by 28 points. That's a 31-point swing toward Democrats since 2016 (or toward 27-year-old Anheuser-Busch beer distributors). Among those celebrating, Senator Claire McCaskill might have been dancing with a lampshade on her head. Not saying she was. Just that she might have been. 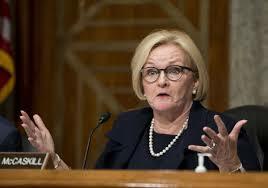 McCaskill has been considered (especially by Republicans) the most vulnerable Democratic senator. She's been blessed (once again) by a male Republican opponent who's already stepped on his weenie, and this special election in the Missouri 97th House District must surely cheer up her prospects for reelection.